Eastern Province Review – From residential buildings to shopping malls, educational and cultural buildings to medical facilities and commercial and industrial premises, the Eastern Province is witnessing robust growth. Industrial Construction - The services offered by the industry in connection with the building and maintenance of the region’s factories, warehouses and larger commercial facilities are reviewed. Bahrain Review - The spotlight is turned on Bahrain’s construction projects and companies. Protective Coatings - The harsh environment of the Gulf has spawned an industry in itself. Gulf Construction looks at the leading exponents and products in the battle to protect building and construction works in the region. Roofing - The companies and materials that keep out the rain and the heat are examined in this feature. Security Systems - Today’s environment demands that architects and designers take into account various security systems which are required to safeguard buildings. Doors and Windows - A look at both the functional and decorative requirements for doors and the range of windows and apertures available to the industry. Plant Hire – Equipment rental is now big business with contractors looking to reduce their capital costs. Oman Review - The achievements and progress of the sultanate are examined. Egypt Review - The country’s construction activities in focus. The Big 5 Saudi 2016 – The industry-leading Big 5 brand stages the sixth edition of its Saudi event at the Jeddah Centre for Forums & Events (March 7-10). Access Equipment – In focus is everything from aerial work platforms to cranes. Architectural Ironmongery - A review of the uses of ironmongery in architecture, from gates to internal fittings. Ceilings, Floors and Partitions - A look at the latest materials that transform an empty shell into a habitable environment. Ceramics and Sanitary Ware - News from the firms that supply the materials for the interiors. Handtools - The range of such specialist tools for the contracting sector is increasing. Kitchens - The focus is on user-friendly, high-tech and aesthetic facilities. MEP Services - A look at companies, products and services involved in this important sector of the industry. Roads and Bridges - Ensuring an efficient road network is a top priority for governments. New developments are reviewed. Riyadh Review – Massive growth is shaping the construction sector in Riyadh from social housing and real estate development to the mega new Riyadh Metro project and the airport expansion programme. Qatar Review - The projects, companies and personalities in Qatar’s booming building and construction industry are in the spotlight. Industrial Doors and Gates - The spotlight is turned on the wide range of doors and gates including automatic, overhead, industrial, fireproof and security versions. Germany and the Middle East – A review of the part played in the Middle East by the industrial powerhouse of Europe. Drainage and Sewerage - Specialist contractors, technology and equipment involved in this important infrastructure sector of the industry are highlighted. Excavators - A look at the latest machines for trenching, earthmoving and demolition. Fire Protection - Building safety is a top priority in design. A look at the progress made in this important sector. Ground Engineering - A review of the techniques required to cope with the region’s unique ground conditions. GRC - One of the most versatile and well-suited building materials for the region is examined. Hospital Construction - A specialist area of construction that demands high quality, safety and hygiene, and peak performance of equipment and services day and night. Rebar - The all-important element in reinforced concrete construction. Renovation and Refurbishment - A growing and important sector of the industry where millions of dollars have been allocated. The Cement Industry - A look at the products and the companies involved in all aspects of this basic building material, from additives to specialised chemicals designed to enhance the product. Dubai Review - A look at the progress being made on major developments in this resurgent market. gulfBID, gulfInteriors and Gulf Property Show 2016 - A preview of the Northern Gulf’s premier building, interiors and property shows to be staged at the Bahrain International Exhibition and Convention Centre (April 26-28). Project Qatar 2016 - A preview of Qatar’s leading construction expo to be staged at the Qatar National Convention Centre (May 2-5). SBIE 2016 - A preview of Saudi Building and Interiors Exhibition to be held at the Jeddah Centre for Forums & Events (April 11-14). Cityscape Abu Dhabi – A preview of Abu Dhabi’s mega real estate showcase to be staged at the Abu Dhabi National Exhibition Centre (April 12-14). Air-Conditioning and Refrigeration - A review of the changing technology involved in the HVACR sector. Bricks and Blocks - The basic materials in any building project. 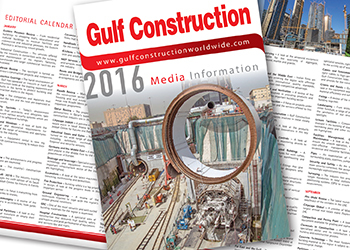 Gulf Construction looks at the options including decorative products. Carpets and Floor Coverings - A review of the possible coverings available, from luxurious carpeting and marble flooring to vinyl coverings. Industrial Surface Coatings - The range of industrial surface coatings is examined, highlighting everything from primers to fire-retardant finishes and heavy-duty industrial coatings. Loaders - From skid-steer to track loaders, Gulf Construction reviews these workhorses of the construction industry. Stained and Decorative Glass - A review of the specialist companies that make glass a work of art. Saudi Arabia Review - The annual spotlight on the largest market in the region. Index 2016 – A preview of the region’s largest interior design showcase to be held at the Dubai World Trade Centre (May 23-26). Cladding and Facades - Latest developments in products and techniques. Geosynthetics - A look at geomembranes and geotextiles that play an increasing role in soil reinforcement and foundations, landfill construction, waterproofing as well as road and rail construction. Construction Finance and Insurance – The financial institutions and other administrative services that often go unseen. Pumps, Valves and Compressors - A look at these vital components for the transmission of water, air and fluids. Timber and Plywood - Basic materials for building - the sources and applications of these elements are reviewed. Weatherproofing - The technology and companies involved in keeping out the sun, sand and rain in the Middle East are reviewed. Britain and the Middle East - A review of how Britain is maintaining its traditional ties with the region’s construction industry. Corrosion Technology - New developments in the never-ending battle to protect structures against one of the most virulent problems. Forklifts and Telehandlers - These versatile machines are finding wider applications. Railway Construction - A look at the massive projects in progress as well as the latest products and construction technologies available for the construction of railway systems throughout the region. Green Buildings - Sustainability in both the use of materials and energy sources is increasingly important in the construction process. Fibre Reinforced Plastics (FRP) - A look at the range of FRP, including glassfibre-reinforced products that are being developed for the construction industry. Lighting - The lighting industry’s contribution to building and construction-related projects throughout the area is reviewed. Marble and Granite - Extensively used in the construction of beautiful buildings. Quarrying - A look at the advanced equipment available for the quarrying of aggregate, limestone, marble and granite. India and the Middle East - Indian firms are increasingly entering the region with offerings that match international quality standards, thanks to their cost-competitive advantage. Air Control and Ventilation - A review of the companies involved in providing products and services for this important building sector. Airport Construction – A focus on projects under way by the region and the services offered to this vital sector. Dredging and Reclamation - Gulf Construction looks at the companies involved in these closely associated industries. Building Finishes - A look at the products available and the latest innovations in this key sector. Instrumentation and Controls - A look at the latest systems, from monitoring devices to building management systems. Portable and Prefabricated Buildings - A review of temporary structures for work camps, pre-engineered buildings for warehousing and modular construction. Interiors - The fixtures and fittings that give building style and the interior designers who conceive beautiful surroundings. Tensile Membrane Structures – From canopies to expansive roofs, these airy membrane structures provide aesthetic and lightweight solutions. Lifts and Escalators - The technology of vertical transport is always on the move. Steel - One of the most basic construction materials is examined. Plant Hire – A wide range of top-quality equipment required by contractors is now offered on hire - from handtools to heavy construction machinery. Turkey Review - This important market is put under the spotlight. The Big 5 Kuwait 2016 – The Big 5 brand stages the fourth edition of its Kuwait event at the Kuwait International Fairground (September 25-27). Far East and the Gulf – The region is seeing an increasing number of Far Eastern firms providing specialist services, right from railway construction to the setting up of waste water treatment plants. Cables and Telecommunications - From fibre optic cables to high-performance fibre networks, Gulf Construction looks at the range of products and services for the construction industry. Cranes and Hoists - Gulf Construction takes a look at the equipment available to move man and material efficiently and safely on sites. Fixings - A review of the components that hold a building together. Landscaping - From bricks, blocks and tiles to street furniture, a range of products that enhance the aesthetics of our environment is in the spotlight. Leisure Facilities - Companies and materials involved in the building of stadiums, theme parks, swimming pools and other recreational facilities are highlighted. Facilities Management, Operations and Maintenance - A look at the key players that ensure the smooth operation, maintenance and cost-effective management of commercial, residential and industrial facilities. Pipes - An examination of the technology surrounding pipes, pipelines, pumps and coatings. Security and Safety - As the world becomes more security-conscious, the sector is developing increasingly sophisticated systems. Surveying - The industry has progressed from simple theodolites to total stations and global positioning systems (GPS) to ensure accuracy in measurement. Abu Dhabi Review – The latest round-up on the wealthiest of the emirates in the UAE. Cityscape Global – A preview of Middle East's largest annual real estate event (September 6-8). Compaction and Paving Plant - A look at the equipment available for grading and asphalting. Chemicals in Construction - A look at this specialised sector and its contribution to the building and construction process. Concrete Technology - The most fundamental building material in the region is subject to rapid technological change. Partitions – A look at diverse systems including demountable and moveable partition walls that meet today’s market demands for flexibility, aesthetics and privacy. Power Generation and Generator Sets – The manufacturers and their products that are serving this vital sector of the construction market. Scandinavia and the Middle East - The excellence of Scandinavian engineering is known throughout the region. The spotlight is on how Scandinavian companies are faring. Water Technology - A look at water treatment, desalination and transport. Big 5 Show 2016 - A preview of the region’s leading building and construction expo staged at the Dubai World Trade Centre (November 21-24). Saudi Build 2016 - A preview of the construction, technology and building materials expo staged at the Riyadh International Convention & Exhibition Centre (October 17-20). Information and Communications Technology - ICT systems have invaded every conceivable area of the work environment. Gulf Construction highlights their use, from the drawing board to the site. Drilling and Tunnelling - The increasing demand for subsurface construction in the region calls for the services of specialist companies, sophisticated machinery and products. Glass and Metal - What’s new in glazing and curtain-walls. Precast Concrete - Economy, aesthetics and durability are just some of the advantages of precast concrete. Sealants and Adhesives - A review of locally manufactured and imported products. Northern Emirates - Small but active, the Northern Emirates are an important source of work in the UAE. Big 5 Show 2016 - Special issue for the region’s biggest construction expo (November 21-24). China and the Middle East - Chinese products and construction firms are penetrating various sectors of the Gulf’s construction industry. Crushers, Screens and Concrete Batching Plant - This range of equipment ensures the quality of aggregates and concrete used in today’s infrastructure. Demolition - From hammers and dozers to controlled demolition using explosives, a variety of skills and technology are employed to clear sites or decommission structures. Hotels, Palaces and Luxury Villas – Construction of luxury public and private buildings demands a wide range of top quality products, exclusive fittings as well as special expertise. Paints and Coatings - A review of the manufacturers and suppliers of paints and other coatings with specific emphasis on the technology of today. Waterproofing - An essential part of building to ensure structural durability. Jeddah – A multiplicity of new projects including the world’s tallest building, infrastructure developments, hotels, and commercial and tourism facilities are creating a dynamic market in this commercial capital of Saudi Arabia. Makkah and Madinah – A look at the massive development taking place in these two Holy Cities. Kuwait Review - The building and construction industry in Kuwait is in focus. Bathrooms, Fittings and Water Heaters - A review of the latest designs and fittings that go into making beautiful bathrooms. Environmental Protection and Waste Management – With the growing awareness of environmental issues and sustainability, the focus is on achieving ‘green’ credentials. Facades - A look at curtain-walling, architectural glass and natural stone used in facade engineering. Insulation - Vital to the economic well-being of the region, insulation is an important subject highlighted in this feature. Scaffolding and Formwork - A look at the equipment and companies involved in temporary works. Transport and Materials Handling - A review of the facilities and services available to the industry, from import and export services to the movement of plant and even power stations.